Mt. Hood Community College guard Courtney Jackson took the inbounds pass and dribbled along the baseline before being surrounded by three SW Oregon defenders. "For me, I had to keep my eyes up. If there are three people on me, then someone must be open," Jackson said. She sent a pass out top to teammate Kassidy Ellett, who took a dribble to her right and launched a high-arcing shot into the air from 16 feet out. 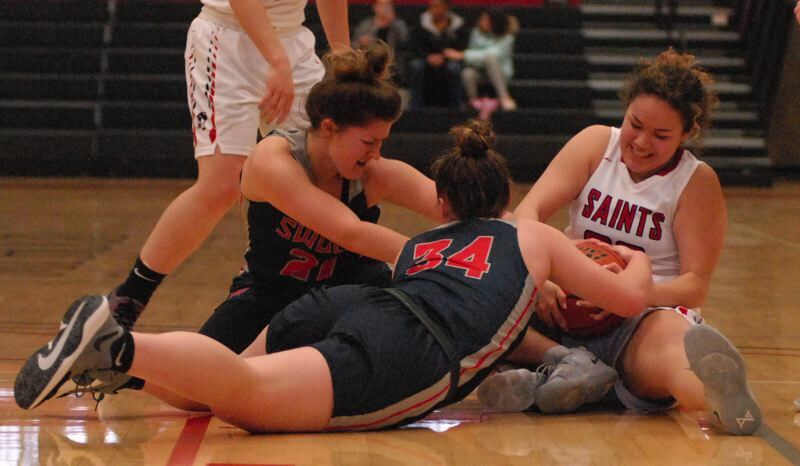 Everyone turned to watch the spinning ball, as it ripped through the net with 0:02 left to give the Saints the 70-69 comeback win in their league opener Wednesday afternoon. "That was the whole team, putting in the work to set it up, and they trusted me to hit the shot," Ellett said. "I didn't feel any pressure, I was excited to be in that moment." SW Oregon called a timeout to advance the ball to halfcourt, but the Lakers would be held without a shot when Mt. Hood's Emily Webber got a hand up high to tip the inbounds pass off target. "I had been in foul trouble most of the game, but I'm tall and have a long wingspan so coach put me out there," Webber said. "I put as much pressure on the pass as I could. It seemed like slow motion, but I just reacted and got the ball." 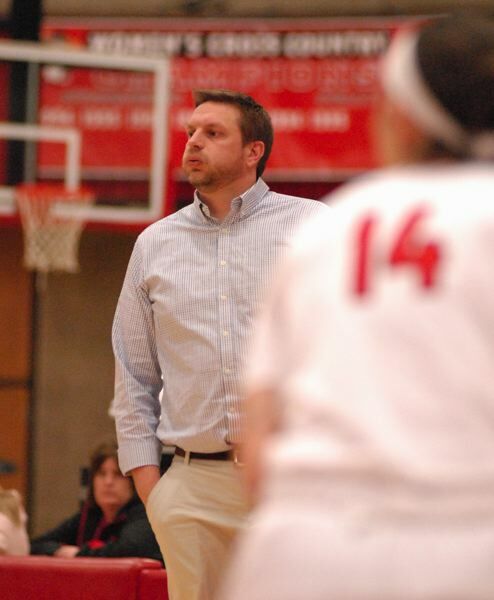 "The girls stepped up and hit some big shots, and played some phenomenal defense at the end," Mt. Hood coach Jeremy Vandenboar said. 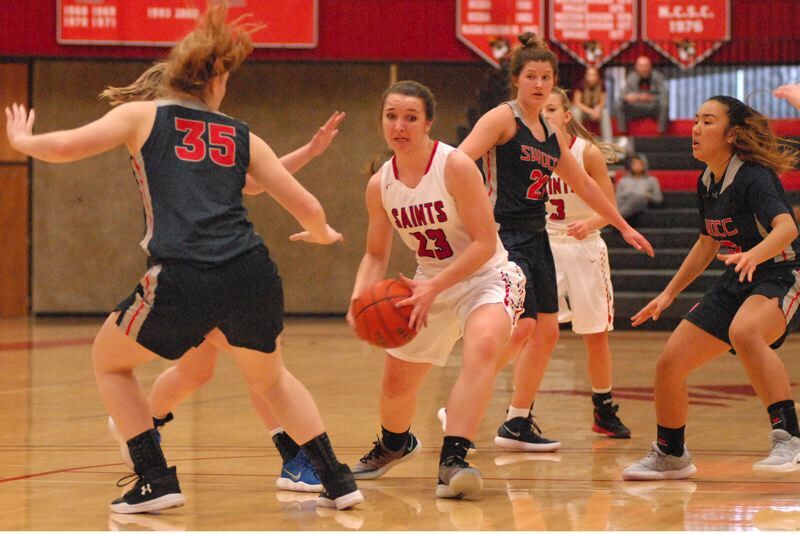 The Saints host powerhouse Umpqua, which reached the Northwest championship game last season, at 2 p.m. Saturday. "Every win is going to be huge in the South — there is not a night that you can take off," Vandenboer said. Mt. Hood appeared to be in trouble after Keiko Aotaki sank a deep 3-pointer to put SW Oregon up six points nearing the two-minute mark. "We knew we were almost out of time, and we needed to go if we were going to have a shot at winning it," Gresham High graduate Madison Allen said. Bri Rosales made the first step on the comeback journey by hitting a trey from the right side to bring it back to a one-possession game. SW Oregon worked deep into the shot clock and attempted a hand-off at the top of the arc, but Ellett stepped into the space and swiped the ball away leading to a layup by Atalina Pritchard. On their next trip, the Ellett found Allen in the corner for an open 3. She had missed her previous seven long-ball attempts, but this one swished through to tie the game 67-67 with 0:52 left. "I was having an off night, but I still wanted to shoot the ball," Allen said. "It's one of those things you have to work yourself out of." SW Oregon's Jessica Peterson hit a pair of free throws to give her team the advantage down the stretch, but the Lakers missed a pair of foul shots with 10 seconds left to keep the door open for Mt. Hood. The Lakers took a 22-15 lead early in the second quarter only to see its advantage disappear within a minute. The Saints put up a barrage of baskets, capped by Jackson's 3-pointer to climb in front by one. It would remain a tight contest the rest of the way with Mt. Hood taking a 53-48 late in the third quarter after Allen faked a 3-pointer, drove the baseline and flipped the ball over the side of the rim to beat the shot clock. SW Oregon (69) — Jasey Ramelow 19, Jessica Peterson 14, Keiko Aotaki 10, Madison Bell 7, Abby Neff 7, Zoie Baker 5, Katie Pearce 4, Meghan Holloman 3, Wegner. Mt. Hood (70) — Courtney Jackson 24, Tasha Beckett 10, Bri Rosales 9, Rachel Watson 7, Kassidy Ellett 6, Madison Allen 5, Atalina Pritchard 5, Hunter Boske 2, Abby Webber 2, E. Webber, Lyles, Jensen, Kuehlbach.